GN is a major centrifuge manufacturer with state-of-the-art manufacturing processes and advanced domestic and international processing technologies. The manufacturing precision of advanced imported processing equipment guarantee equipment in Taiwan, Germany and Italy has reached international standards. Mainly involved in the industry: drilling fluid solid control treatment, industrial wastewater treatment, waste mud treatment, oil residue separation, municipal sewage purification engineering, mining wastewater treatment, river dredging and so on. It is especially suitable for the solid solution with small particle size, small solid-liquid two-phase density difference (solid-liquid phase specific gravity difference >0.05), and the integration scheme of liquid-solid separation occasions where separation is difficult. It can also be used for separation between liquids or between liquid and solid. It has been widely used in modern industrial processes, and is widely used in chemical, food, light industry, paper, mining and other industrial fields. The screw ejector is the core component of the centrifuge. Its main function is to transport sediment and provide drainage channels. Its structure, materials and parameters are not only related to the production capacity and service life of the centrifuge, but also directly affect the efficiency and separation of slagging. effect. The machine adopts a column/conical spiral, which consists of a spiral blade, a mandrel, a spiral-shaped end shaft, etc., and is supported on the drum-sized end cap by bearings on both ends of the journal, and the bearing is lubricated with grease. All important parts of the GN solid control centrifuge are made of 2304 duplex or 304/316 stainless steel. The spiral blade is inlaid into a replaceable wear-resistant alloy piece, which can extend the service life of the pusher. The acceleration cone output port of the mandrel is equipped with a replaceable alloy grinding port wear-resistant sleeve, and the acceleration shaft of the mandrel is equipped with an acceleration. Strip design can improve the processing effect. The use of open-cell spiral blades improves the clarification effect. It mainly plays the role of supporting and installing the whole rotary system. It also plays the role of vibration damping and vibration isolation together with the vibration isolator to reduce the propagation and influence of the vibration of the centrifuge to the external environment. The integrated steel structure welding machine base supports the whole rotating body (consisting of drum, spiral, differential, etc.) through the bearing seats at both ends, and the split-type sealed stainless steel collecting box covers the entire rotating body and is installed on the machine base. The elastic vibration isolator is installed at the bottom of the base, and the sensor cable is arranged on the bottom of the base. The main and auxiliary motors are arranged at one end of the base, and the inlet pipe is arranged at the other end. 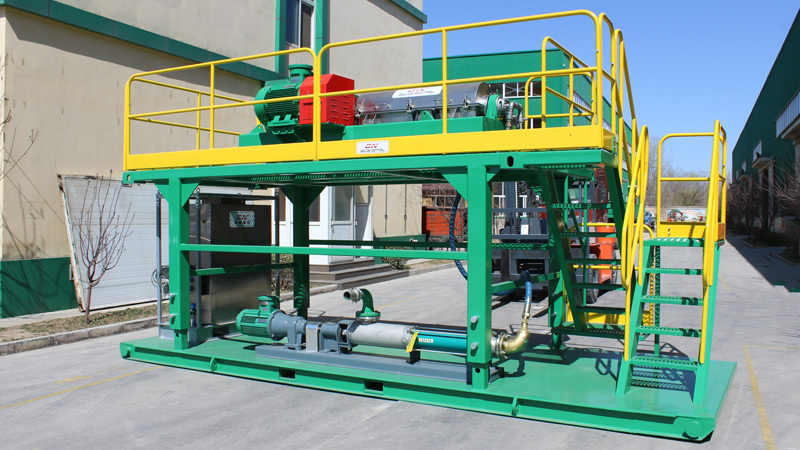 The overall layout of the GN makes the machine compact, small footprint and easy to maintain. The bearing is grouting to ensure the stable operation of the centrifuge. The bearing seat is divided into a large end bearing seat and a small end bearing seat. The bearing housing body is cast by cast iron, the bearing inner ring is respectively mounted on the large end cover, and the whole rotating body is in two main bearings. Internal rotation, lubrication with circulating oil, labyrinth seal on both sides of the bearing.